Cat O'Nine Tales is the fifth collection of irresistible short stories from the master storyteller. Ingeniously plotted, with richly drawn characters and Jeffrey Archer's trademark of deliciously unexpected conclusions, some of these thirteen stories were inspired by the two years Jeffrey Archer spent in prison, including the story of a company chairman who tries to poison his wife while on a trip to St Petersburg-with unexpected consequences. The Red King is a tale about a con man who discovers that an English Lord requires one more chess piece to complete a set that would be worth a fortune. In another tale of deception, The Commissioner, a Bombay con artist ends up in the morgue, after he uses the police chief as bait in his latest scam. The Perfect Murder reveals how a convict manages to remove an old enemy while he's locked up in jail, and then set up two prison officers as his alibi. In Charity Begins at Home, an accountant realizes he has achieved nothing in his life, and sets out to make a fortune before he retires. And then there is Archer's favorite, In the Eye of the Beholder, where a handsome star athlete falls in love with a three-hundred-pound woman...who happens to be the ninth richest woman in Italy. Jeffrey Archer is the only author to have topped international bestseller lists with his fiction, non-fiction, and his short stories. 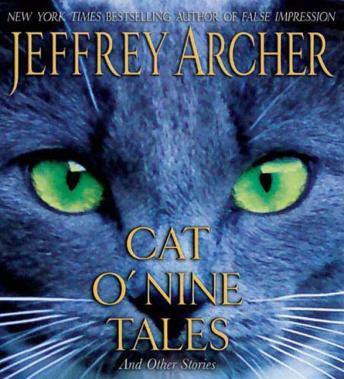 Cat O'Nine Tales is Archer at his best: witty, sad, surprising, and unforgettable.